Accurately measuring granite countertops allows you to maximize your kitchen's square footage to ensure that you have enough space to prep and prepare meals, do homework and gather with friends and family for great conversations. And while it might seem like measuring granite countertops is a straightforward process involving the basic mathematical principle of length times width, it can get a little tricky when your space requires specialized cuts and curves. 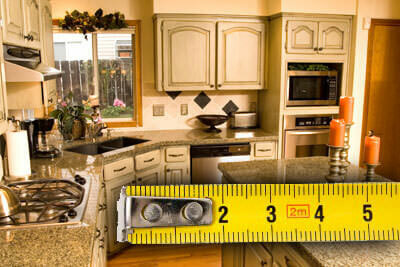 Take measurements of the entire length of each countertop you want covered in granite. Make sure you measure in inches, and multiply the length by 25.5 inches since typical cabinets are 24 inches and you'll want a 1.5-inch granite overhang. Divide the figure you get by performing the steps above by 144. This will reveal the square footage you'll need to cover in granite. Factor in the backsplash, which is done by multiplying the length along the wall where the backsplash will by by 4 inches and then dividing that number by 144. Repeat this process for all sections of your countertops–from the area that surrounds the sink to the smaller parts by the appliances to the island–and then adding all of the figures together. Once you've finished all five of the steps listed above, you will know with precision how much granite it will take to cover your cabinets with granite.